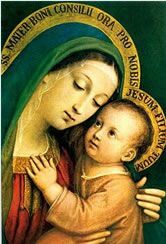 O God, you gave us Mary, Mother of Jesus Christ, your beloved Son, to be our Mother. You glorified her in a wondrous apparition as our Mother of Good Counsel. Grant that by always following her counsels we may be able to live after your own heart and arrive happily in our heavenly homeland. We pray through Christ Our Lord. * Send your prayerful intentions to be remembered at our Lady's Shrine, especially during the Mother of Good Counsel Novena, April 17-25 . * Read about the origin of the painting.